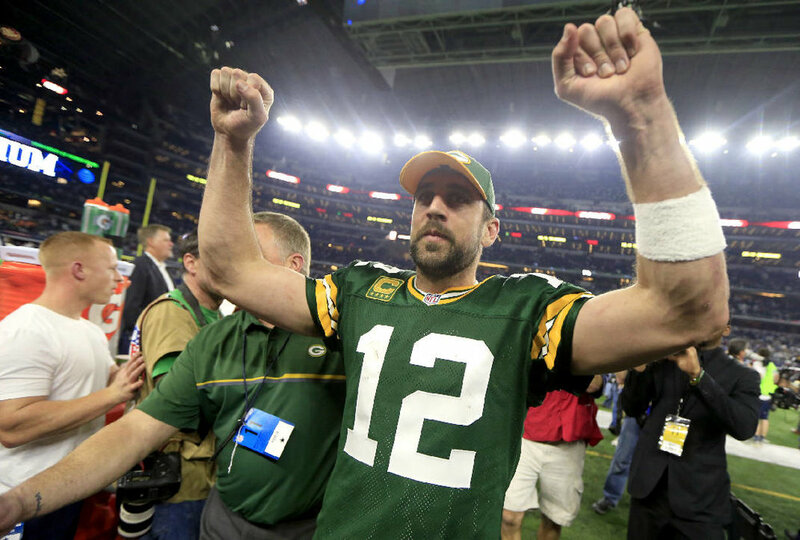 After one of the more bizarre and divisive sports weekends in memory, brought into fruition by you know who, this past week saw things return to ‘normal’ a bit. We also saw Cam Newton find out he’s not as cute as he thinks he is, and mess up his yogurt money in the process. This resulted in Cam making a video apology, which inadvertently led to the reporter he offended getting a couple of her old tweets with racial slurs re-tweeted, and then having to make an apology video of her own. And none of the faux-outrage police, embedded in social media strife since Wednesday, will care about this forgettable fracas by next week. We are all in for that Foreman/Seagal brawl, however. Whenever, or wherever, it may occur…Vegas, Moscow, Bangkok, or Elon Musk’s Mars™. Seagal always struck us as a total weirdo, who made mostly terrible movies. Big George is a bit odd himself, or at least purposefully disingenuous, with his fifteen (don’t fact check this) kids and grandkids all named George or Georgette, giving us that wide-smile, while hocking dorm-room grills for the last few decades. We weren’t alive for the Rumble in the Jungle, but we’ve watched When We Were Kings on 40-50 occasions. And we root for Ali to bomaye every time. But Foreman is still pretty likable, plus can you really trust a guy dressed like this?!? Especially when he pronounces Vladimir Putin, with such disturbingly perfect Russian precision?!?! Give me the Ole Meineke Muffler Man over Russian Citizen Seagal. Back to more serious business, like contests that happened, or will happen, soon. After a sterling 5-1 in our Week Three Goodfellas BDay edition, Nostrabombus broke even at 1-1 last week. We’re back to a full slate with a Pick Six this week, three NCAA, and three NFL. But first, let’s plow thru a few other issues. The less said about that Trojan L, the better. If we had a dollar for every time since 2004 that the Trojans went to the Pacific Northwest, on a short week, on a nationally televised night game and laid an egg? We could buy at least one premium beer at a sports arena. 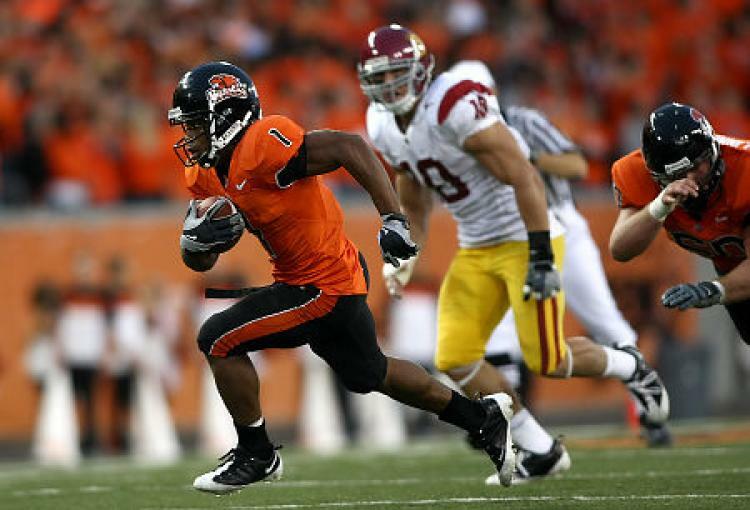 We’re reminded of busy little Oregon State Beaver Jacquizz Rodgers, running thru the legs of the best linebacking corps in modern college history (Rey-Rey Maualuaga, Brian “Lattimer from The Program” Cushing, Clay “Grendel” Matthews Jr. and Keith “Hines Ward Rule” Rivers) like a drop of mercury, on a Thursday night in Corvallis back in 2006. Or Jake Locker running all over a Carroll-coached potential title team in 2009 like he was Vince Young in the Rose Bowl. You know what? We’re not doing this. Let’s just keep it moving. RUN THE DAMN BALL! Ronald Jones is unstoppable. Feed him, utilize that enormous offensive line, let Baby Face work off play action, and you win. Birds winning, covering, doing so in front of a Carson CA crowd that was overwhelmingly Eagle Fans, while the Chargers kept it interesting for a while, and Phillip Rivers thru another tantrum before taking an L.
Did you know that at the quarter-mark, the Philadelphia Eagles are the NFC’s rushing yardage leader? 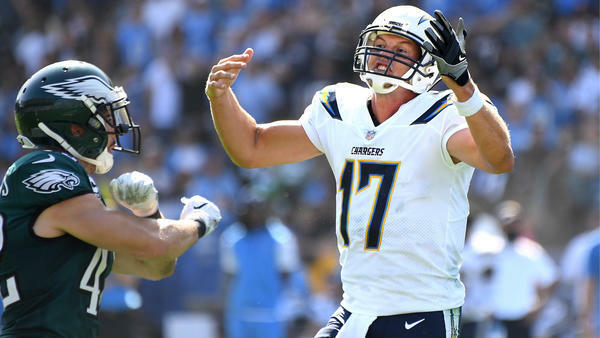 So, I have to give a bit of a mea culpa, because obviously the re-focus on the ground game, led by LeGarrette Blount, who we said was late-career Lendale White, has helped greatly, even if this is still a running-back-by-committee situation, while the quarterback and the return of Spiked-Vein Lane on the offensive line, are the main ingredients making the whole thing go. 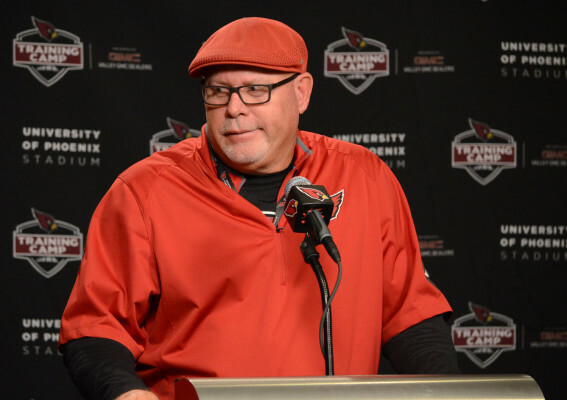 Bruce Arians, aka Coach Kangol, and the Arizona Cardinals have won their last two games against the superior Birds. But that was when Chip was in the process of sinking the ship. Expect Arians fate in Philly to more closely resemble his old days in Philly, coaching at Temple. Fun Fact: Bruce Arians is from Paterson, New Jersey, aka the school and town upon which Lean on Me was based. Do you think the character of Kid Ray was based on him? The Linc may end up resembling the Eastside High cafeteria this Sunday afternoon. Staying in Philadelphia for a bit, Stream of Processness got its first opportunity to see Ben Simmons in person, on Wednesday night at Wells Fargo Center, against the Grizz. First thought, wow, Ben Simmons is HUGE. Like, looking closer to 7-foot than 6’10” now huge. And he’s unstoppable driving to the rim already, without even bothering to attempt a jump shot, or without really knowing how to finish when he gets there. But despite what will surely be growing pains to come, the kid passes the “am I looking at a future superstar?” test. Speaking of growing pains, Markelle Fultz’ preseason debut was far less stellar. We’ll try to keep in mind that he’s only 19, while playing off the ball for the first time. But safe to say, he’s got nowhere to go but up. Meanwhile, Jerrod Bayless is putting shots up every time he gets the chance, making up for lost time since he missed last season and recently passed Gerald Henderson for “Oldest-Looking 29-Year-Old Alive”. It’s great to see JJ Reddick in a Sixers uniform. The Sixers haven’t had that guy whose shot you know is dropping when he gets an open look since Kyle Korver. Robert Covington looks like he’s been drinking milkshakes of granite all summer. His chisel is as impressive as his defense and his three-ball seems much improved. Jahlil Okafor is apparently a vegan, and definitely lost weight. But he’s still slow and can’t jump over a blade of grass after the lawn’s been cut. We’re glad Dario is getting some well-deserved rest after playing every NBA game of his rookie season, then playing for Croatia all summer. And last but definitely not least, it was good to see that not only is Joel Embiid out playing tennis under the lights at 25th & Pine and going out for midnight jogs in Philly, but now fully scrimmaging, possibly playing in the preseason and most importantly, STARTING OPENING NIGHT! Outlook: This game looked a lot more impactful before Florida State lost their starting quarterback in the season opener, while in the midst of a competitive contest against Alabama, the class program of this decade in college football. It lost even more luster when Florida State promptly lost at home to NC State for the first time I can recall since Phillip Rivers became the first ACC team to win in Tallahassee, back in 2003. But Florida State still has elite athletes, a pedigreed program and a coach with a national title, who's never had a truly awful season. You think these kids don’t know they could salvage some dignity, by righting the ship in an inter-state rivalry they’ve owned for years? You think Miami wasn’t a little bit more keyed up for this a month ago, or even two weeks ago before the hurricane (no pun) got it postponed? You really wanna lay a field goal on a team that's never beat Florida State this decade? This line moved from a pick-‘em, to a three-point spread, with Miami money all week. Sounds like a perfect time to ride the other side. Nostrabombus Pick: Free Shoes/Seafood University. Outlook: Wait a min-, am I reading that line correctly?!? Washington is favored to win a conference game by more than four touchdowns?!?! Against a Cal team that beat a decent SEC team, plus held their own for three quarters against USC? I’ll take the 29 points, please, and Thank You Based God. Nostrabombus Pick: Lil B’s hometown squad covers the monster number. Outlook: Let-Down. Trap Game. Call it what you wanna call it. 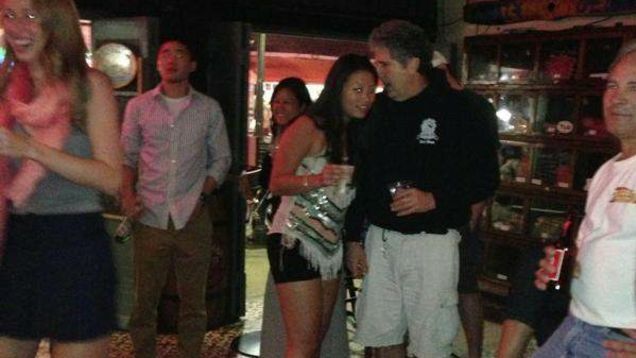 They’re still Washington State, and Mike Leach is still a raging alcoholic. Who knows what kinda bender he went on after last Friday night, the biggest win of his career. Playing in Autzen Stadium is not easy. Playing there on a Saturday night is even less so. Playing in Autzen as a road favorite on a Saturday night, with a gaggle of juiced-up Duck Fans right on top of you, versus an Oregon team currently feeling like an afterthought in an incredibly deep Pac-10?!? Nostrabombus Pick: Chip Kelly’s old school might win outright, but we’ll take the field goal. Outlook: Bruce Arians’ stint coaching the Cardinals, like Kid Ray, may be dead in a year. And sadly, the same can probably be said for Carson Palmer’s career. 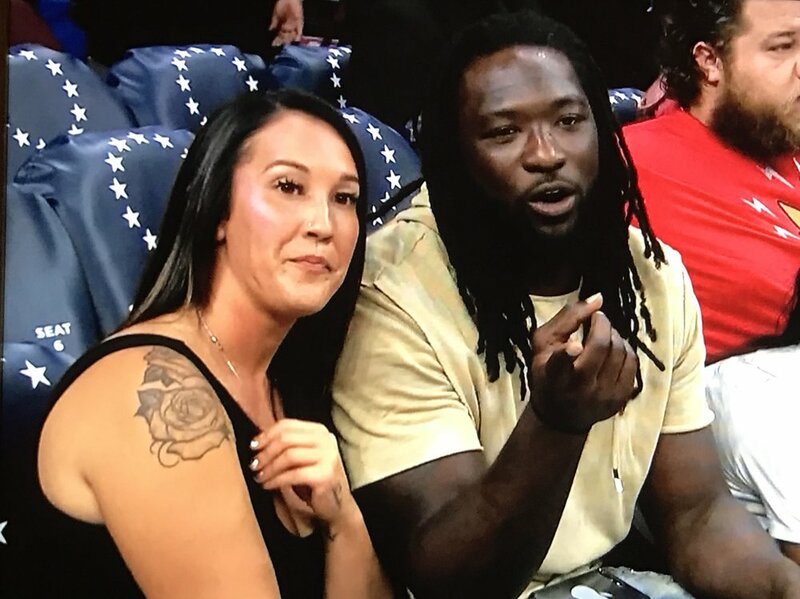 Nostrabombus Pick: The younger, better, Carson & Company, including Nouveau East Coast Beast Mode, whose crew made a splash last night at the Sixer game. Outlook: Look, few enjoyed that Rams win in Dallas last week more than me. And I am happy for a few of my people in L.A., that the Rams are relevant for the first time since “Drop It Like It’s Hot” was hot. But I’m still not totally buying it, mostly because I’m not sold on Jerrod Goff. I watched dude play for three years in the Pac-12. Never once saw him win a big game. Saw some footage from last season’s train wreck, maybe the worst a rookie quarterback ever had. This year, now that Jeff Fisher’s perennial mediocrity has been replaced by Young Coach McBae, Goff has improved dramatically, but did so against only one good defense. The Rams are the #1 scoring offense in the NFL. That stat can’t last. This feels like a step-back game. 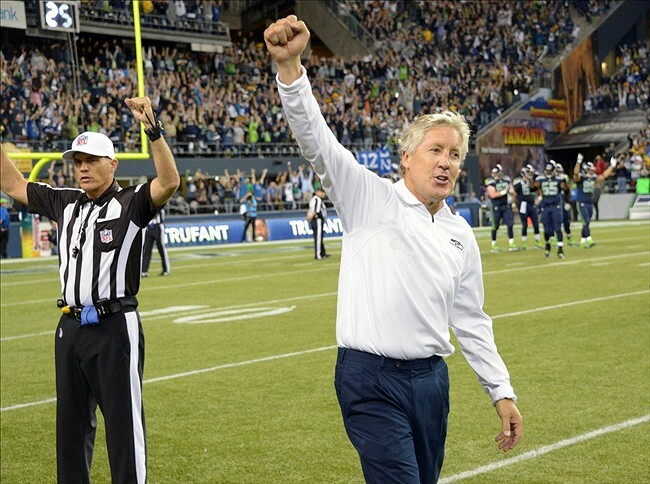 Nostrabombus Pick: The Seahawks blew a perfect week for us two weeks ago. We’re gonna risk strike two and take them again here. We’ve seen Sneaky Pete win a lot of games in that stadium. His team needs this one desperately. Outlook: We always love watching these two teams play, dating back to the early 90’s. And if you read Wudder Sports last postseason, you know how we feel about GODgers, while we’ve seen what he can do in this monstrosity Mr. Jones built. But early this morning we spoke with one of South Jersey’s most legendary Cowboy Fans: our boy that works the weekend overnight shifts at Cherry Hill 7-11. He’s been giving us the drop on Cowboy predictions, good or bad, since Emmitt Smith was still playing in Dallas, while he was in there rocking his ratty #22 jersey. He confirmed our feelings. Dallas’ secondary is about to get shredded on Sunday. Nostrabombus Pick: In GODgers We Trust. Editor’s Note: Header pic taken outside Candlestick Park, before an Eagles/49ers game, Fall 2008. Photo courtesy of my surrogate West Coast Little Sister Kate Nasuti. Caption: When in enemy territory, it’s good to align yourself with the right allies.